Sony fans (or those considering a move to the Sony camp), I have something great to share with you: the Sony FE 100-400mm f/4.5-5.6 GM OSS Lens. I asked the "Which Sony telephoto lens should I get?" question in the Sony FE 70-200mm f/2.8 GM OSS Lens review and that lens was one of the right answers. Another right answer, especially from a general purpose perspective, is this one. The Sony FE 100-400mm f/4.5-5.6 GM OSS Lens plugs a big gap in the Sony E-mount lineup that was, until now, looking rather sad, especially from an outdoor photography perspective. This is going to be an extremely popular lens among wildlife and field sports photographers – and parents. The Sony 100-400mm GM Lens delivers impressive image quality from a well-built and well-designed lens that is sized to go with you and be easily handheld. Choosing the right focal length or focal length range is of utmost importance for lens selection as the focal length determines the perspective and framing combination. With a range that starts at 100mm (medium telephoto) and goes to 400mm (without teleconverters, a moderately-long telephoto length), this lens covers a lot of uses, including many general purpose telephoto needs. I have a 100-400mm lens with me a significant percentage of the time. As already hinted to, one of the best uses for the 100-400mm focal length range is wildlife photography. At the wide end of the range, large and/or very close wildlife can be captured in its entirety and environmental portraits are often a potential. Or, there are some subjects that you may not want to get closer to and this focal length range is there for you in that regard. When the wildlife is scared of you (or vice versa), 400mm permits capturing images with more-distant subjects rendered large in the frame. Smaller birds and animals often need longer focal lengths to have a substantial size in the frame and these are included in the great subjects list for such a telephoto lens. Especially nice is that these subjects can be found as close as the backyard. I was in need of some assured wildlife availability for completing this review, so I visited ZooAmerica in Hershey, PA and spent a few of hours with this park's birds and mammals. In this situation, the animals were acclimated to people and even 100mm was too wide at times, but the longer focal lengths were especially useful in background selection. Less area of quality background is needed with the narrower angles of view at the longer focal lengths and the background remaining can be more-diffusely blurred. 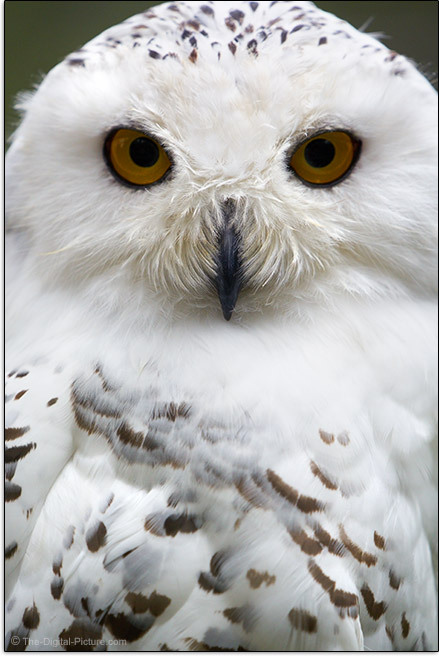 The Canada lynx above was captured at 100mm (f/4.5, 1/250 and ISO 5000) and the snowy owl below was captured at 382mm (f/5.6, 1/200 and ISO 2500). 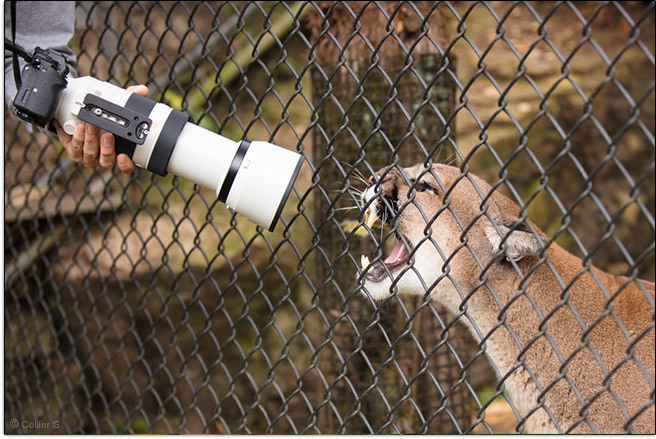 As of review time, this telephoto zoom lens is the ideal zoo and safari lens option for many Sony-based kits. A 100-400mm lens is often a great choice for photographing people. 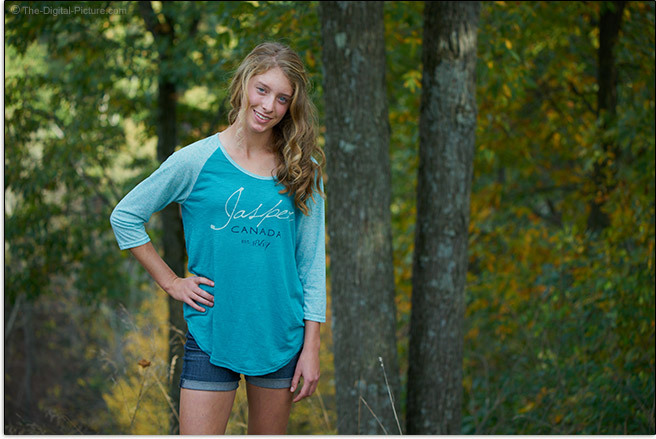 The wide end has great portrait photography capabilities, even indoors if adequate ambient light is available. 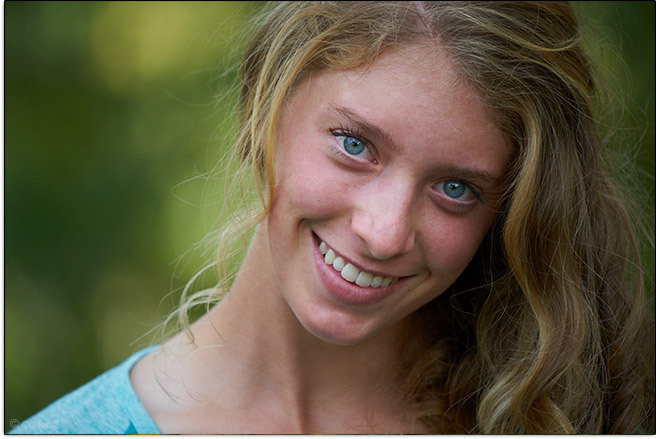 The long end, typically more-easily used outdoors, will provide a more-compressed appearance (due to the longer subject distance) and with that comes a stronger background blur (the background blur becomes more-strongly magnified), illustrated in the playful head shot below. The above image was captured at 232mm (f/5.6, 1/500 and ISO 800). 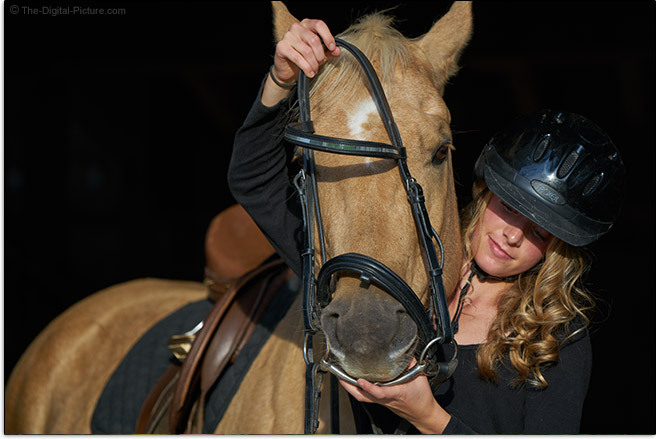 In-the-field/equestrian needs are another more-specific example of a use well-suited for the 100-400. The above image was captured at 128mm (f/5.0, 1/400 and ISO 800). That image begins to cross the line into sports and people participating in sports make great subjects for this lens. While selecting a telephoto lens is a good choice from a safety concern perspective (safety both from and for the subject), it is a good choice because there is often a physical or designated barrier to getting closer, such as a fence or the perimeter lines on a sports field. 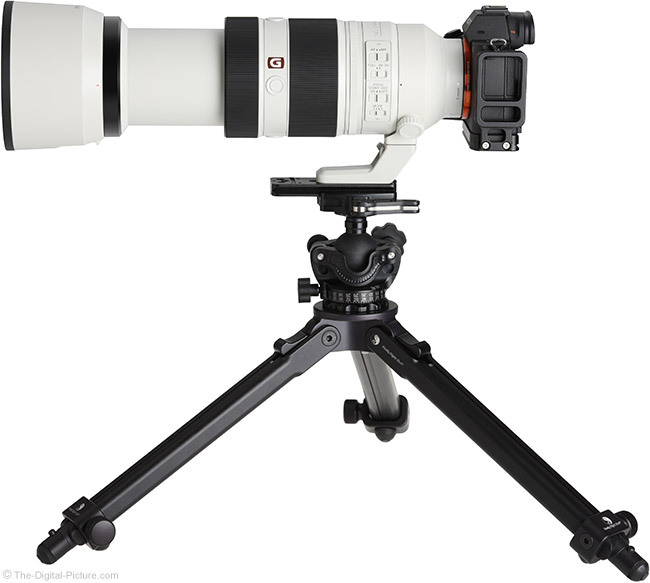 While a full-frame camera-mounted 400mm lens may still feel short when photographing deep into large-field events, in front of an APS-C model where it provides an angle of view equivalent to a 150-600mm lens on a full frame camera, a 100-400mm lens can cover a very significant portion of even large soccer, football, field hockey, lacrosse, etc. fields. Those using a full frame camera might find some cropping needed in more-distant results from these venues, but modestly closer action will be nicely handled by this lens. 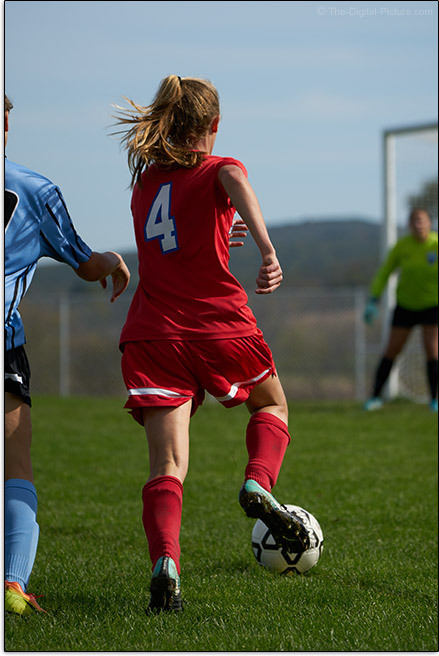 Sports photography needs can cover this entire focal length range and having the ability to track a continuously-properly-framed athlete from a distant location to a close position is a great asset. Having a zoom range vs. using a prime/fixed/single focal length lens means that the proper cropping can be established and maintained in-camera, resulting in full use of your camera's imaging sensor, which in turn results (potentially) in better overall image quality. The above image was a crop taken from a 192mm capture (f/5.6, 1/1600 and ISO 250). I know, I should have zoomed in more. But, sometimes action changes fast and framing needs at short distances change especially fast. It is nearly-always better to keep the action in the frame than to mis-frame with a longer focal length. I use all of the focal lengths in this lens for landscape photography and very commonly use a 100-400mm lens for such. I generally find it quite easy to create attractive, compressed perspective landscape images when using a telephoto lens. Note that long focal lengths can make even a mediocre sunrise or sunset look amazing. While wildlife, sports and landscape photographers will make up large percentage of the owners of this lens, there are plenty of other uses for this wide 4x focal length range. Photojournalists with restricted access to their subjects may find this focal length range useful. This lens works well for product photography. This lens will be very-well represented at air shows. As mentioned, those using an ASP-C/1.5x FOVCF sensor format DSLR will see an angle of view similar to a full-frame-mounted 150-600mm lens. This shifted-narrower angle of view range moves the 100-400mm range deeper into the sports and wildlife uses with bird photography and big-field sports being especially good uses of the focal length range. While still good for portrait photography on an APS-C camera, tightly-framed portraits are most comfortable with lots of space needed for full body portraiture. In the sports discussion, I mentioned that zoom lenses can sometimes deliver better image quality than prime lens alternatives. While prime lenses certainly have their advantages (a wider aperture being a typical one), being able to zoom out to wider angles is not one of them. Moving farther away, if even possible, can be required for optimal framing. Zooming in with a prime lens requires moving closer (sneaker zoom), which is not always possible/practical, or cropping, which reduces overall image resolution. One reason that I sometimes use a zoom lens over a prime to be able to move in front of obstructions (tree branches for example) and zoom out while still maintaining the preferable framing. As mentioned, less cropping may be required due to the ideal framing being quickly selectable via the zoom ring. Inhabiting a position that provides focal length headroom for the subject to move closer or farther allows the ideal composition to be adjusted just-prior to capture, resulting in the highest resolution results possible. Sometimes, laziness (or perhaps, "relaxation" sounds better) is a good reason to use the 100-400mm focal length range. Sit in the comfort of your car, avoid the need to cross a creek, stay back from the surf, etc. The list of uses for this focal length range is huge and goes far beyond those I've listed here. If I am not using it as my primary lens, a 100-400mm lens is usually handling much of the balance of my needs (such as complementing a 600mm lens when photographing wildlife or a 24-70mm lens when photographing landscapes). Because aperture is measured as a ratio of lens opening to focal length and because this lens' maximum opening does not increase adequately with focal length increase to maintain the same ratio, the max aperture available is a variable one, ranging from f/4.5 to f/5.6 as the focal length range is increasingly traversed. As always, the lower the aperture number, the more light the lens will allow to reach the sensor. Each "stop" in aperture change (examples: f/2.8, f/4.0, f/5.6, f/8, f/11) increases or reduces the amount of light reaching the sensor by a factor of 2x (a substantial factor). Allowing more light to reach the sensor permits freezing action and handholding the camera in lower light levels and can also permit use of a lower (less noisy) ISO setting. In addition to allowing more light to reach the sensor, increasing the aperture opening permits a shallower DOF (Depth of Field) that creates a stronger, better subject-isolating background blur (at equivalent focal lengths). The advantages of a narrow aperture, because the lens elements can be reduced significantly in size, include a smaller overall lens size, a lighter weight and a lower cost. Those are factors that we all can appreciate and they apply to this specific lens. A downside to the variable max aperture is that, by definition, the widest available f/4.5 max aperture cannot be used over the entire focal length range. Your camera will automatically account for the change in auto exposure modes, but making use of the widest-available aperture in manual exposure mode is complicated somewhat. The bottom line is that this lens has a relatively narrow aperture at any specific focal length and this lens is not an ideal choice for stopping low light action. When the sun goes down, action sports photographers using this lens (or similar models) will be reaching for very high (noisy) ISO settings to keep images bright enough when using the fast shutter speeds needed to freeze their subjects' motion. This lens is not the best choice for indoor sports or for anything else that moves in low light. Here is a comparative look at the max aperture step-down by focal length for this class of lens. Yes, this lens has an f/4.5 max aperture, but ... it is only available for 16mm of the focal length range, from 100mm through 115mm. That is enough to count and that is enough to give you f/4.5 in those cases where you must have it. That most of the differences shown in the above table are only 1/3 or 2/3 stops should be considered. This lens cannot create the shallowest depth of field among 400mm lens, but by virtue of its long focal lengths, it can create a very strong background blur. 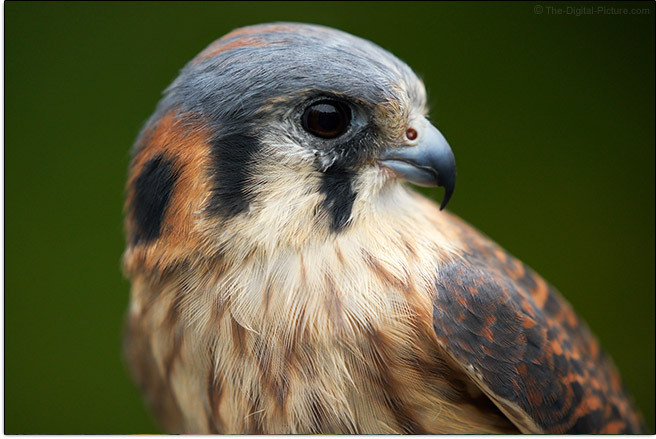 The kestrel image below illustrates this lens' background-elimination capability. You may be surprised to hear that the above image was captured at only 189mm (f/5.6, 1/1000 and ISO 2500). But, with a close subject and distant background, this combination creates a very strong blur. The prior shown head shot illustrates the blur feature at 400mm with a more-distant subject. 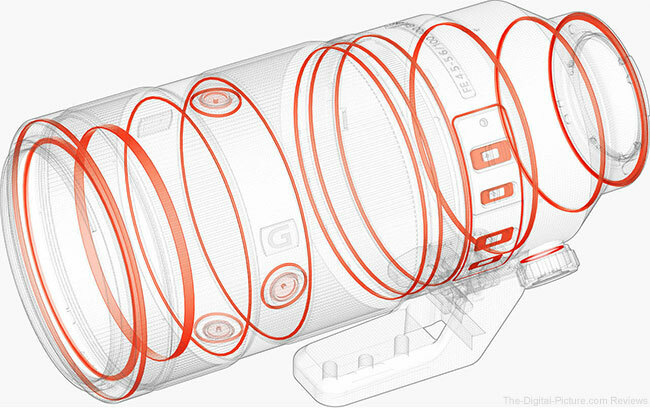 While narrow apertures are not optimal under low light conditions, this lens' optical image stabilization system can save the day in such conditions, significantly increasing the versatility of this lens, improving usability and, in many situations, considerably improving the image quality it delivers. A number of stops of assistance rating is often provided by a manufacturer, but in this case, Sony does not specify one for the lens specifically. Putting OSS to the test: handholding this lens under ideal conditions, using an ultra-high resolution Sony a7R II, most of my 100mm images were sharp at 1/8 second exposures with the keeper rate tapering down to about 50-60% at 1/4 second. The keeper rate rapidly tapered off thereafter with only infrequent sharp results obtained at .4 - .5 seconds. At 400mm, nearly all images were usably sharp at 1/15 second exposure durations. Few 400mm images captured at longer exposures were sharp. Those results tell me that this system does its job very well and those numbers are far better than I could obtain without stabilization assistance. Photographing outside, perhaps in the wind or on unstable footing? Expect to need faster exposures than those I reported. But, also expect a similar amount of assistance from OSS as it is still similarly and significantly compensating for shake. While OSS is great for reducing camera shake-caused blur in images, it is also very helpful for precise framing of subjects in the viewfinder, especially with the narrow angle of view at 400mm. While OSS is active, drifting of framing is not an issue for me with the viewfinder view being well-controlled, not jumping at startup/shutdown and subject reframing being quite easy to accomplish. Both Mode I and II (panning mode, stabilization in one direction only) are provided. This OSS system is almost completely silent with only a faint whir heard with my ear nearly against the lens. Handheld video recording is nicely assisted by OSS and the stabilized composition also provides a still subject to the camera's AF system, permitting it to do its job better. 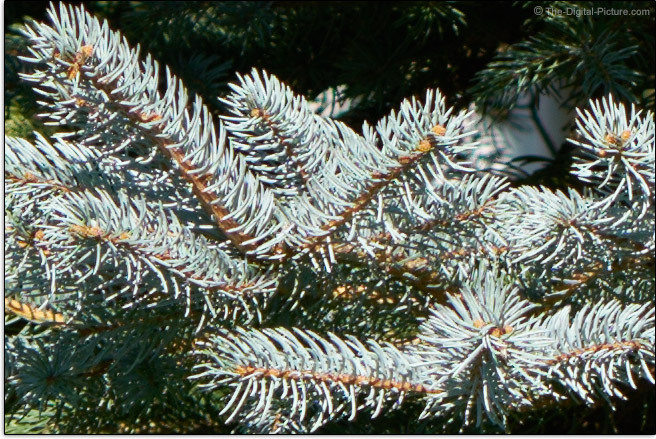 From an image quality perspective, a relatively narrow max-aperture lens is always concerning. Lenses generally reach their optimal image quality when stopped down one or two stops, but when a lens starts out with a variable max aperture in the f/4.5-5.6 range, there is very little stopping down available before running into the softening effects of diffraction. So, critically important is that the wide open aperture image quality be excellent. Fortunately, this lens rocks that requirement. With a wide open aperture, over the entire focal length range, the Sony FE 100-400mm GM OSS Lens is razor sharp from corner to corner even on a high resolution a7R II full frame body. That's fun to say. It's even more fun to see the images reflecting this. I must note one 300mm corner, which happens to be the one showing in the site's image quality tool (the upper-right), appears slightly softer than the other three corners (this issue is also slightly reflected in the 200mm example). There appears to be a slight amount of (likely) astigmatism making the horizontal lines appear slightly softer than the vertical lines in this corner. However, the other three 300mm corners look great and do not share this slight issue. Stopping down one stop clears the minor degradation. In regards to this lens' widest apertures, you can use them without hesitation. Stopping down will make little difference from an image sharpness perspective and, on most high resolution camera models, diffraction will start impacting image sharpness if stopped down more than a couple of stops. There is a lot to like here. The widest aperture images are sharp and, while depth of field can be seen increasing, heat waves/mirage is the primary difference I see between the images (this is most noticeable in the 250mm results). When I figure out how to manually focus the a7R II in the extreme corner, I'll feel comfortable enough to share absolute corner images with you. But, the absolute corners of the test chart, captured at normal subject distances under strict conditions, are very sharp, indicating also that this lens has a flat field of focus. Corner image sharpness is not always a requirement for telephoto lens use, but I love to have it available for when I do want it and this lens has it. Focus shift when stopping down the aperture is not a problem with this lens. One image quality aspect improved by stopping down is peripheral shading or vignetting. This attribute is normal for full frame lenses being used at wide open apertures on full frame cameras with the amount of shading being the question to ask. In this case, the amount is not bad at all. With a wide open aperture, expect about about-2 stops of darkening deep in the 100 and 400mm corners with roughly 1.5 stops in the mid focal length corners. At f/8, about 1.2 stop of vignetting remains at 100mm, .6-.7 in the mid-range and 1.4 stops at 400mm. Better-still are the f/11 results where we see the numbers .7, .4, then .7 and still about 1.2 stops remaining at 400mm, an amount that is just-noticeable in an average scene (and more noticeable if before/after removal is compared). 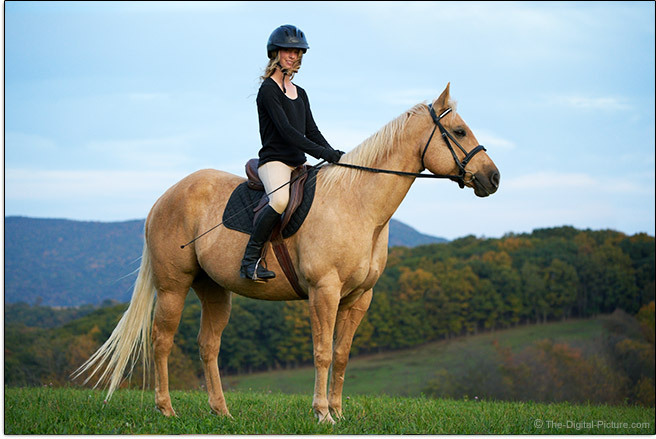 Vignetting can be corrected during post processing with increased noise in the brightened areas being the penalty. Vignetting can also be simply embraced, using the effect to draw the viewer's eye to the center of the frame. The latter tactic often works best when the subject's face is not within the most-darkened portion of the frame. The effect of different colors of the spectrum being magnified differently is referred to as lateral (or transverse) CA (Chromatic Aberration). Lateral CA shows as color fringing along lines of strong contrast running tangential (meridional, right angles to radii) with the mid and especially the periphery of the image circle showing the greatest amount as this is where the greatest difference in the magnification of wavelengths exists. Let's look at a worst-case example (100% crop from an extreme corner of an ultra-high resolution a7R II frame). This is the top left corner. There should be only black and white colors in these images and the additional colors are showing lateral CA. As is often the case with a zoom lens, the amount of lateral CA is strongest at the two ends of the focal length range. In this case, the amount even at the extents is mild with the colors converging and then reversing their magnifications. In the real world, lens defects do not exist in isolation with spherical aberration and spherochromatism generally found, at least to some degree, along with axial CA. These combine to create a less sharp, hazy-appearing image quality at the widest apertures. With this lens, I am not seeing much of the potential haziness, but there is some color fringing as seen in the foreground and background out of focus specular highlights in the 100% crops shown below. The bracelets are silver and light is from a Sony flash, so ideally, no other colors would be present. Stopping down does little to resolve the color fringing, hinting to their cause. This is not unusual for telephoto lenses and in my real-world images, I have not seen anything bothersome in this regard. Put a strong light source in the frame and all telephoto zoom lenses, with their relatively high element count, are going to show noticeable flare effects. 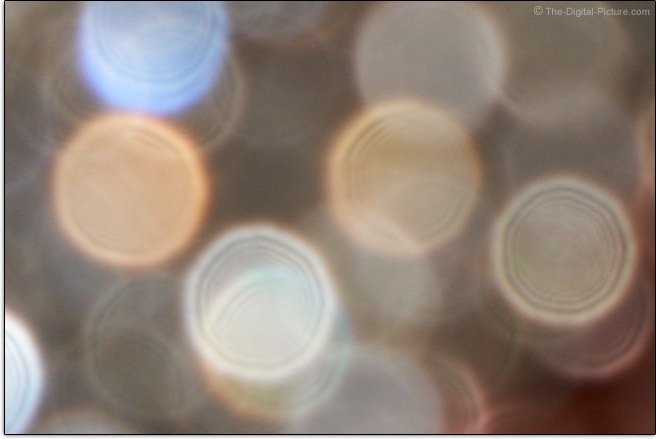 This lens will do the same, showing an average amount of these effects. From a geometric distortion perspective, this lens shows very slight pincushion distortion at 100mm. This distortion increases to mild at 200mm and then remains similar through the balance of the focal length range. Overall, this lens performs well in this regard. Telephoto lenses can create a very strong background blur and the blur quality (bokeh) coming from this lens is very good. Keep in mind that telephoto lenses in general can sometimes create an edgy blur quality, especially when rendering out-of-focus straight lines, such as limbs and/or grasses in the frame. Following are some f/11 (a stopped down aperture insures diaphragm blades are affecting the results) 100% crop examples showing background out-of-focus specular highlights followed by full images reduced in size in the second row. Though well-rounded, the 100 and 250mm examples show especially strong concentric rings. 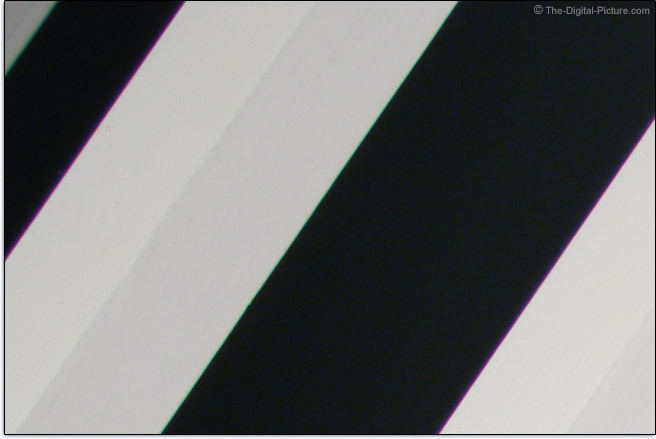 While some concentric rings around the borders of specular highlights are quite normal, this lens shows a few extra. In the field, the background blur has looked very nice, and as already discussed, is very strong. I often talk about a lens' ability to create sunstars when photographing point light sources using a narrow aperture and this lens does create 18-point stars from its 9-blade diaphragm. However, this lens does not create very strong stars, at least in part because, with the relatively narrow max apertures, the aperture blades do not close very far. Overall, I'm quite impressed with the image quality delivered by this lens. It is one of those lenses that you look for additional reasons to use. This lens internally and very quietly focuses very fast. However, overall autofocus performance relies on a camera to complete the task. One AF component, speed, is notably hindered by the Sony cameras available at this time. While the lens seems to focus quite fast, when mounted on the Sony a7R II in AF-Single mode, the lens is de-focused slightly before being focused on the subject, even if focusing at the same distance with the same subject. While AF lock still happens quickly in decent light levels, it could be faster. AF becomes slower in low light levels and hunting sometimes occurs. Most of us consider AF accuracy to be of utmost importance and in this regard, the 100-400 lens performs excellently. 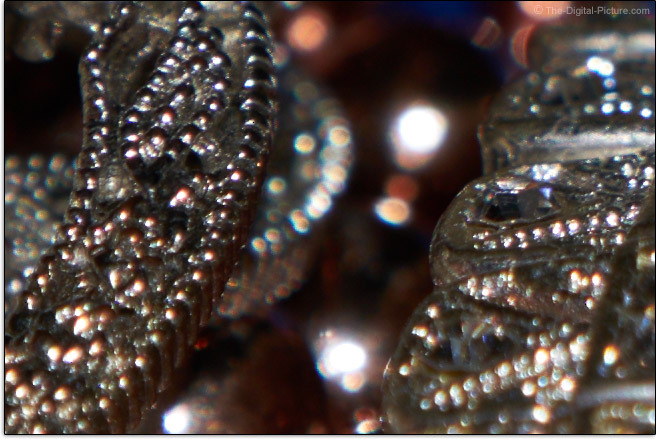 In AF-Single mode, most images were properly focused. I did not have the opportunity to use this lens on the newer Sony a9, but in AF-C continuous focus mode, the short focus hunting practice is likely omitted on this camera and the result would be a noticeably-faster focus acquisition. The a7R II continuous the defocusing procedure in AF-C mode. With the FE 100-400, I photographed a wide range of subjects and some of those were in action. Notable action was a horse trotting/cantering and I photographed a full soccer game with this lens. While a 400mm lens at f/5.6 is not going to challenge an AF system nearly as much as a 400mm lens at f/2.8 can (due to the much shallower DOF it can produce), most action images I captured with this one were properly focused. Common to Sony GM lenses, but unique to this lens class in general are 3 AF hold buttons, located at the top, bottom and left side of the lens. The right side of the lens does not get a button for some reason and while I might make use of such a button in that position (when holding the camera in vertical orientation), the other three buttons are sufficient and I appreciate having them (except that instance when I inadvertently had one pressed). While in continuous focus mode, these buttons can be pressed to lock focus at the currently selected focus distance, permitting a focus and recompose technique without changing back to AF-S (Single) mode. If you don't value this feature, use the camera menu to program these buttons for different functionality. Note that the owner's manual indicates that "the focus hold button[s] of this lens does not function with some camera models." Not mentioned are which cameras are incompatible, but ... one would expect the latest Alpha models to support that feature. A focus limiter switch permits selection of the full focus distance range or a limited 9.84' (3m) - ∞ range with the narrower range improving AF speed in some situations. This lens focuses internally and FTM (Full Time Manual) focusing is available when the camera is in DMF (Direct Manual Focus) mode. The forward-positioned manual focus ring is nicely-sized and very smooth. I find this ring slightly too easy to turn and some additional rotational resistance would be advantageous for precise focusing. Hold a small amount of lens barrel along with the ring to manually impart some drag. This is an electronic manual focus ring implementation and it has multiple focus adjustment rates depending on the ring's rotation rate. I dislike this feature, though this one doesn't bother me as much as some others I've used. Especially with a camera lacking an optical viewfinder, I don't really care if the focus ring is mechanical or electronic, but how it is tuned makes a lot of difference and at this point in time, I generally prefer manual rings better than the electronic variants. I expect that it is only a matter of time until the differences in feel are erased and again, this lens has one of the better electronic manual focus ring implementations I've used. That said, I find the focus ring rotation to affect focusing slightly quickly for ideal precision at 400mm. At 100mm, the adjustment rate is nice. The smooth focus ring surface with nice shallow ribs provide a good tactile experience. Photographers intending to use focus stacking techniques, videographers pulling focus and anyone very-critically framing a scene will appreciate that subjects remain similarly-sized during focus distance adjustment. Subjects in the frame go in and out of focus of course, but the framing remains consistent in appearance. While a distance window is not provided, a focus distance meter shows in the lower portion of Sony's electronic viewfinders during manual focusing. An advantage of an electronic focusing implementation is that parfocal-ness can be (at least nearly) tuned into the lens and the review lens appears to support this feature. At the Sony 100-400 GM lens' 38.6"(980mm) minimum focus distance (MFD), this lens delivers an easily best-in-class 0.35x maximum magnification (MM). No, that is not a typo. There are very few non-macro lenses that surpass the max magnification capability of this lens and this feature is very useful for tight head shot portraits, small critters, product images, photos of details and much more. Here is a table comparing the close focusing capabilities of lenses in this class. Worth noting is that the Canon option is not too far behind the Sony in this regard and the differences would not likely be enough to push one to choose one camera brand over the other. But, 0.35x in a telephoto zoom is excellent and, again, useful. 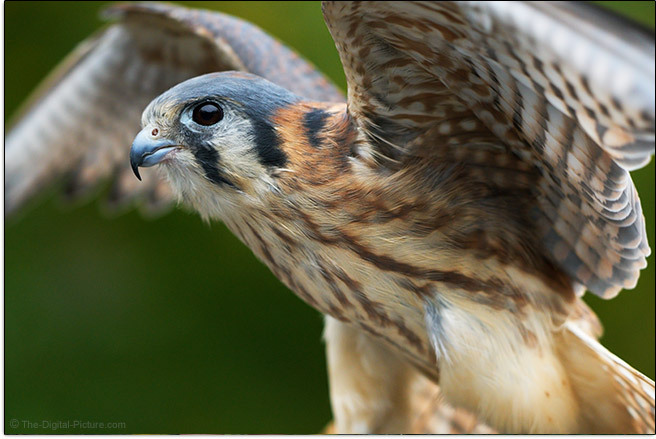 The kestrel in the image above was photographed at the MFD/MM (or very close to it) of this lens. Magnification can be increased modestly through the use of extension tubes which are basically as their name implies, hollow tubes (with electronic connections) that shift a lens farther from the camera. Doing so allows the lens to focus at closer distances, though at the expense of long distance focusing. The Sony FE 100-400mm GM OSS Lens is compatible with the Sony FE 1.4x and Sony FE 2.0x Teleconverters. The addition of a 1.4x Teleconverter creates an attractive full frame 140-560mm OSS lens with a 1-stop narrower max aperture (f/6.3-8). While the focal length versatility provided by the TC is very nice, magnifying the image by 1.4x has an impact on image quality. Based on the native 400mm sharpness of this lens, I expected very good optical performance from the with-1.4x combination, but the actual test results were not quite as good as I hoped. This lens does not get much sharper when stopped down at 400mm, and it only gets modestly sharper when stopped down to f/11 at 560mm. Autofocus performance is one impact that teleconverters can have on a lens. In this case, performance with the 1.4x remains good in reasonable light levels. It was a dark, cloudy day when I tested this performance and outdoors, focusing performance remained fine. Indoors with only dim ambient lighting caused focusing to slow way down and sometimes fail after some hunting. Use the 2x Teleconverter to create an impressive 200-800mm OSS Lens with ... painful on a slow lens, 2-stops of max aperture loss. This combo results in an f/9-11 max aperture range. More positive is that maximum magnification is also multiplied by 2. I am seldom enamored with the performance of 2x teleconverters and you will likely find the 800mm f/11 image quality a bit rough – though not terrible. This lens is natively as sharp wide open as it is stopped down and stopping down with the 2x TC in place makes little difference in the results with the softening effects of diffraction also coming into play at f/16. With the Sony 2x mounted, barrel distortion is increased, but that increase is just about the right amount needed to offset the native 400mm pincushion distortion, resulting in a very well-corrected distortion profile at 800mm. Lateral CA is very noticeably increased by the 2x. The 2x has a more-noticeable impact on focus speed, though it remains quite usable in the outdoor conditions I just described. In more dimly lit scenarios, focusing is slow and hunting with eventual failure is more common. The FE 100-400mm GM OSS Lens is a top-of-the-line Sony Grand Master lens and excellent design and build qualities are aspects these lenses all share. It is typical for a lens manufacturer to maintain at least some consistency across lens models and the FE 100-400 GM shares many of the FE 70-200 f/2.8 GM's design features. Shared features in this case include a great physical appearance with the same matte-light gray/white color looking sharp against the black zoom and focus rings (the light color also promises to keep the lens cooler under direct sunlight). Also shared is a relatively-constant diameter. Not shared is a fix lens size. All 100-400mm DSLR/MILC lenses produced to date extend to reach the 400mm focal length and this one does the same. The amount of extension is 3.22" (81.9mm). The zoom ring is nicely sized and requires just the right amount of rotational force to turn it – that feature courtesy of the friction adjustment ring. At the lowest friction setting, the lens will gravity extend (or retract if directed upward). At the highest setting, that does not happen, though the lens is not locked and can be used normally in this setting. A clockwise zoom ring rotation selects a longer focal length. Those familiar with Canon lenses will require some mental retraining as this zoom ring rotates in the reverse direction while the Nikon or Sony-experienced will feel right at home with this design. That the Sony 100-400 GM's zoom ring is located to the rear of the lens, behind the focus ring, is ideal and a differentiator in its class. 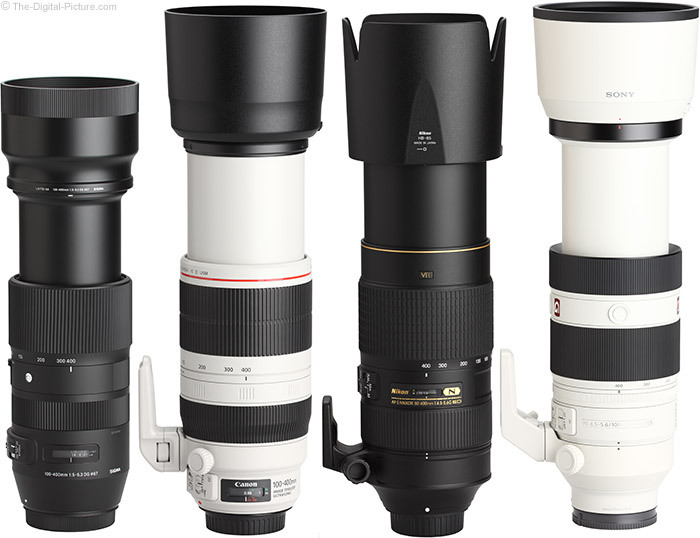 All other current 100-400mm lens designs feature the zoom ring located toward the front of the lens, though the actual zoom ring positional differences between the Canon, Nikon and Sony lenses are not big. 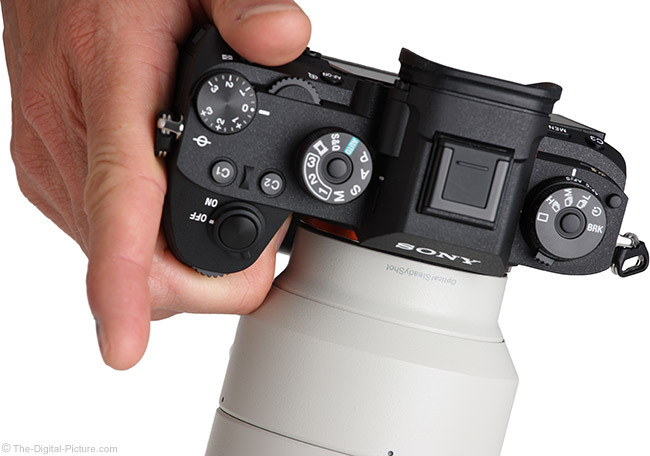 With the Sony lens balanced in the left palm, fingertips are free to quickly rotate the zoom ring (without the focus ring coming into play) while the right hand is free to change camera settings and capture images without having to support the weight of the camera and lens. Prefer the fast action of a push/pull-style zoom lens? Simply grasp this one on the black section immediately behind the hood and you have this feature. The shallow, well-populated switch bank is conveniently located with all typically-available switches present in recessed form. Unlike some switch-less Sony lenses that require camera settings changes for enabling or disabling features such as MF and OSS, this one provides the functionality at your fingertips, enabling fast and easily discernable changes. Notice the serial number on a label in the image below? While it is a very durable label, I'm not sure this is the ideal solution for a permanent means of identification. This is a weather sealed lens (not to be confused with waterproof), as hinted to by the mount gasket seal seen above and verified by Sony's gasketing illustration below. "The lens’s front element features a fluorine coating that helps to prevent dirt and fingerprints from sticking, and makes it easier to wipe dirt and fingerprints away if they do become attached to the lens surface." [Sony] These coatings work very well and are especially appreciated when a front element cleaning becomes necessary in the field, where this lens will find frequent use. While this lens is excellently-designed and great to use, the camera's grip is a factor and ... I'm not a fan of the current crop of Sony Alpha camera grips including the a7R II and a9. While these cameras are compact, their grips are not sufficient to provide clearance for the knuckles on my medium-sized hand to clear the lens. 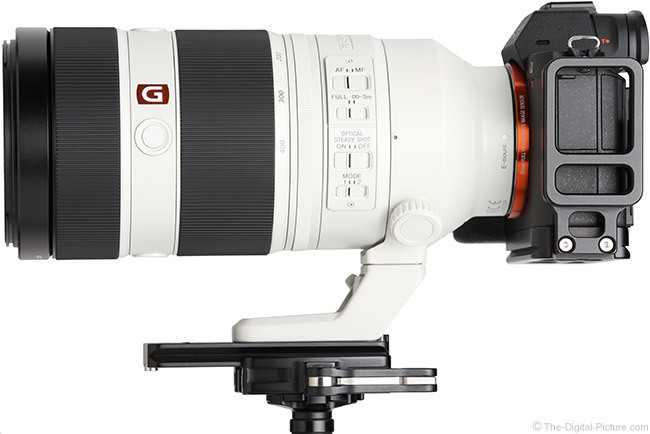 Below, the Sony FE 70-200mm f/2.8 GM OSS Lens is shown mounted to the Sony a7R II. 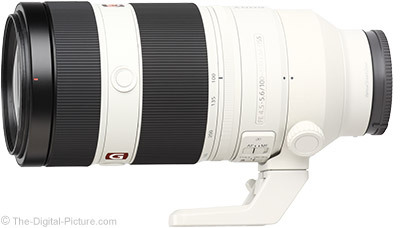 The fit of the FE 100-400 GM is about the same. Apparently, Sony camera designers have very small hands – or that small dimensions are more important than comfort and control from a marketing perspective. "Magnesium alloy components and other refinements contribute to high durability as well as class-leading size and weight reductions that not only mean greater mobility, but improved manageability with lightweight bodies for easier, more stable handheld shooting." [Sony] Still, there is no getting around the physical requirements that make a 100-400mm lens somewhat large and heavy relative to standard/normal zoom lenses. Those never using one of these lenses may require some acclimation and a monopod or tripod may be found helpful for weight relief during very long periods of use, but ... most do not have a problem using lenses of this size for relatively long periods of time. The Sony FE 100-400 GM Lens weighs more than the Sigma option (lacking a tripod ring) and weighs less than the Canon and Nikon options, though the differences are slight in all cases. Here is a comparative look at current 100-400mm and and similar lenses, focusing primarily on the size and weight aspects. 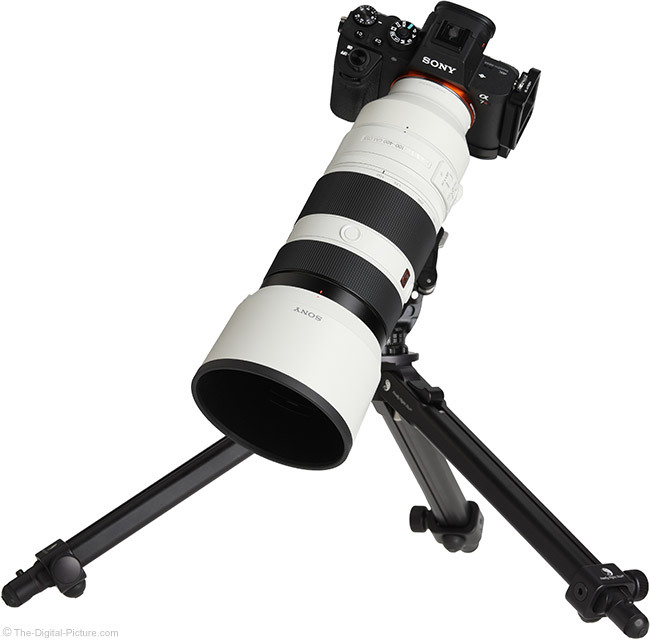 For many more comparisons, review the complete Sony FE 100-400mm GM OSS Lens Specifications using the site's Lens Spec tool. The same lenses are shown below with their hoods in place and fully extended. 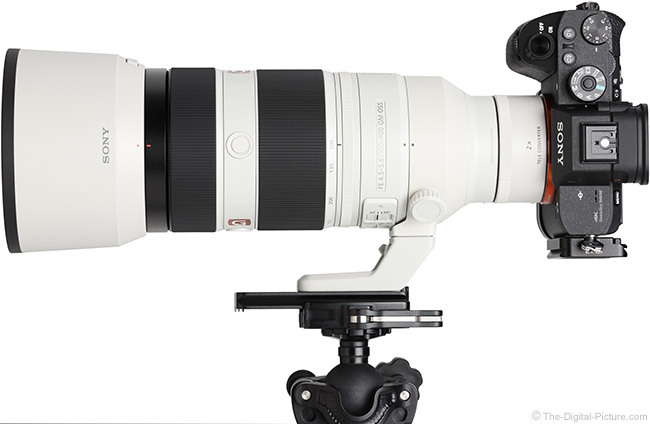 Use the site's product image comparison tool to visually compare the Sony FE 100-400mm GM OSS Lens to other lenses. Note how the Sony 100-400's inner lens barrel is smaller relative to the outer diameter than the other lenses shown here. The surfaces that meet when retracted are beveled, minimally adding style points for this lens. This lens accepts the ultra-common 77mm filter size. Being common makes these filters easy to find and share, though the relatively large filter size means they are not the least expensive models out there. When lenses reach this size and weight, they become too heavy to hang from a camera-mounted tripod, causing a significant sag after the head is tightened and potentially tipping the tripod over. While the Sigma variant omits this ring for weight and cost savings, the others include this ring. 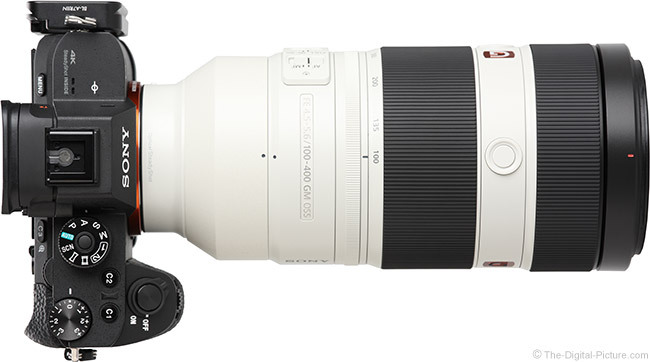 I should note that a Tamron 100-400mm lens has been announced and this ring will be optional for that model. Using a lens of this size mounted on a tripod ring is very easy and vertical orientation is easier to achieve than with any camera-mounted setup as the tripod ring can simply be loosened – allowing for rotation of the camera – and retightened. The tripod ring included with this lens is very nicely integrated into the design. This ring is not removeable, but that design decision aids in the smoothness of this ring in use and this is a very smooth-rotating tripod ring, showing smooth rotation while being tightened, right up until the point of being locked. While the tripod ring is not removeable, the foot itself is. A large thumbscrew on the side of the foot unlocks the foot, allowing it to be removed. When everything is locked tight, this foot is quite solid. With two threaded inserts on the bottom of the foot (instead of one), lens plates can be more securely attached, resolving the twisting issue that can occur in single threaded-insert designs. A Wimberley P30 Quick Release Lens Plate is shown attached in some of the product images in this review. All of the 100-400mm lenses include a lens hood in the box. The size of the Sony ALC-SH151 lens hood is relatively large, but it provides significant protection from flare-inducing light and from dust, rain and impact. The rounded style of this hood means that the lens will sit upright on it – when you can trust doing so. The hood is plastic, though quite rigid for its thickness. The push-button release allows the hood to stay locked into place, yet install and remove with ease. The interior is flocked for maximum reflection avoidance. 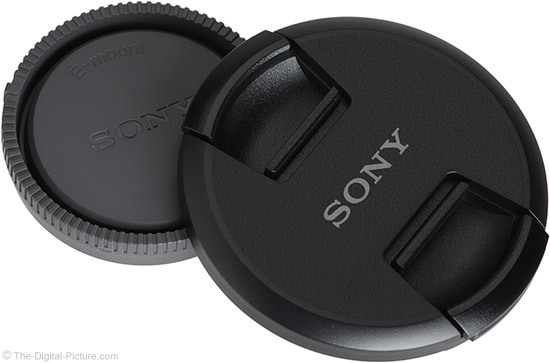 Sony included the filter adjustment window feature in this lens hood design. Unfortunately, I have not found these to be useful. There is simply not enough room in the window to rotate a circular polarizer filter enough per finger swipe. Most often when I am adjusting a CP filter, I need to rotate it 90 degrees because I have also rotated the camera the same amount. To make that adjustment through the little window takes a frustrating number of little rotations. I would rather remove the hood and hold the filter in place while I rotate the camera, holding the previously-established effect. Even when making small rotational adjustments, I typically want to rock the filter back and forth a substantial amount and watch the results to determine the correct position for optimal filter effects. Not all CP filter adjustments are as large as 90 degrees and the filter window is less aggravating to use for minor changes. If this filter adjustment method is your preference, no problem. This Sony lens has you covered with a window that can be positioned at the top or the bottom of the lens, depending on the orientation of the hood when it is installed. However, expect to sometimes find the window open as removing the camera-mounted lens from a case can cause this annoyance. I epoxied the window closed on one of my own similar lenses and am happier with it fixed in place. 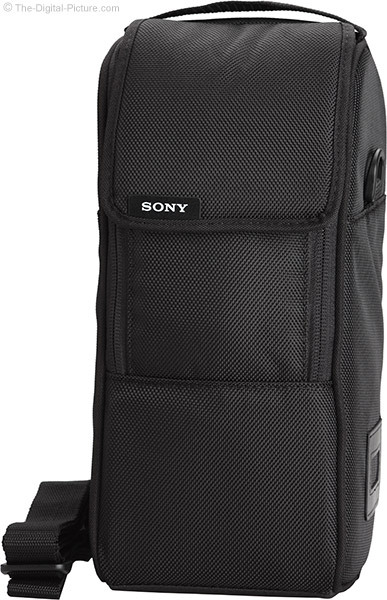 Sony delivers this lens in a nice, useful zippered padded nylon case with a neck strap and a 2" belt loop on the back. 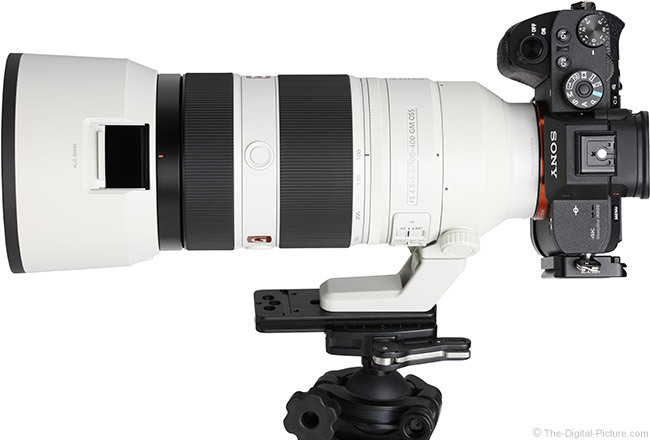 The Sony FE 100-400mm GM OSS Lens is currently the most expensive lens in its class, priced noticeably higher than the second-place Nikon 80-400. Although Sony cameras may seem comparatively appealing in terms of price, you will not likely find the same to be true in regards to Sony GM lenses. While the price is high, the image quality, performance and usefulness of this lens make it worthy of its price. 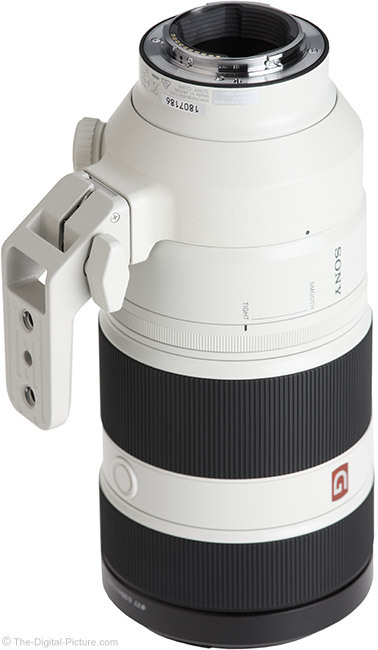 As an "FE" lens, the Sony FE 100-400mm GM OSS Lens is compatible with all Sony E-mount cameras, including both full frame and APS-C sensor format models. 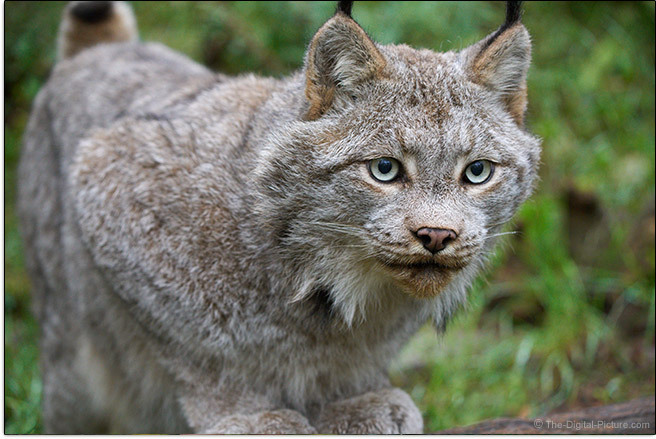 It does not appear to be mountain lion-compatible. This lens comes with a 1-year limited warranty. The lens used for this review was obtained online/retail. 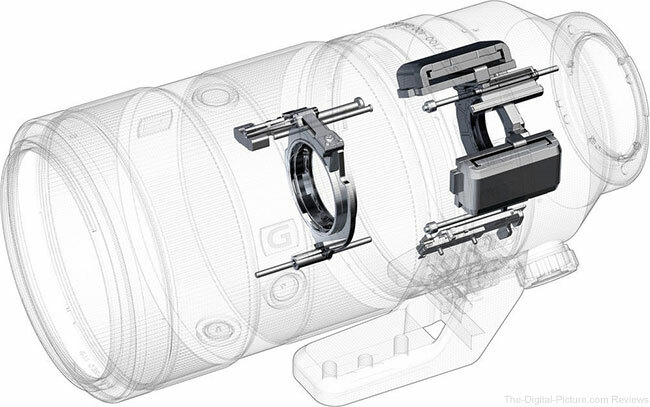 Canon, Nikon and Sony make lenses for their own camera mounts only. Tamron and Sigma make 100-400mm lenses for Canon and Nikon camera mounts and the Sigma also has a Sigma mount version. As of review time, Canon mounts lenses (usually) can be made to function on a Sony E-mount camera via a lens mount adapter. But, (generally) adapted lenses do not perform as well as Sony FE lenses on Sony E-mount cameras. Thus, if performance – most notably AF and frame rate performance – are important (especially on the a9 and likely all future models), I highly recommend staying with the manufacturer brand lens in this case. 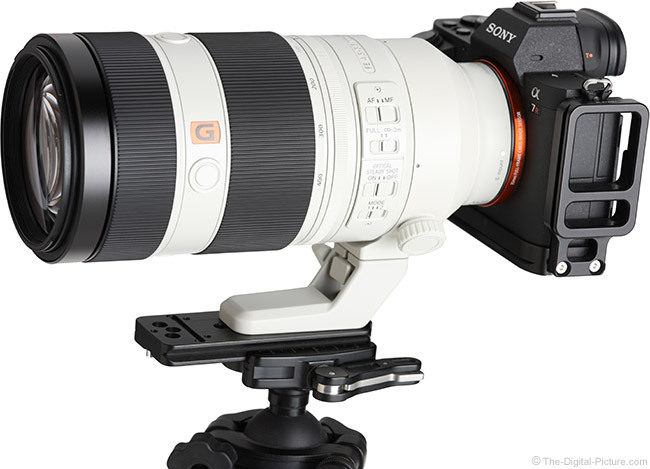 The Sony FE 100-400mm GM OSS Lens is the outstanding, no-compromise solution. The Canon camp is in love with the Canon EF 100-400mm f/4.5-5.6L IS II USM Lens, a well-built and superb-performing lens. In the image quality comparison (note that different cameras with differing resolutions are used in this and the next comparisons), I see these two lenses performing about the same. The Canon takes the 300mm wide-open corner, but I already mentioned the Sony having a single slightly weak corner at 300mm. The Canon has less peripheral shading, primarily at the focal length range extents. While the two lenses have differing geometric distortion profiles, it would be hard to pick a winner. The Sony is better at 100mm, the Canon is better from 135-200mm and the two are similar at the longer end of the range. The Canon has a 1/3 stop aperture advantage over some of the range, perhaps most notably from 162-311mm. The Sony has a modestly higher maximum magnification spec (0.35x vs. 0.31x). The Canon is slightly heavier and the Sony is slightly longer. The Sony's tripod foot is more rigid. The Canon costs considerably less. The Nikon camp has the Nikon 80-400mm f/4.5-5.6G AF-S VR Lens as their closest option, adding 20mm to the wide end. We last tested this Nikon lens on the Nikon D3x, formerly the highest resolution Nikon camera available, but not nearly as high-resolution as the Sony a7R II we tested the FE 100-400mm lens with, so ... use discernment when evaluating this comparison. My take is that the Sony has a slight edge until 400mm where the Sony has a noticeable advantage. The Nikon has less peripheral shading than the Sony. With a minimum focus distance that is nearly half as far as the Nikon's spec, the Sony has a significantly higher maximum magnification spec (0.35x vs. 0.20x). The Nikon takes 67mm filters vs. 77mm. The Nikon is less expensive, but only moderately so. Three. That is the number of Sigma 100-400mm f/5-6.3 DG OS HSM C or Tamron 100-400mm VC Lenses that you can buy for the price of one Sony FE 100-400mm GM Lens. If you need a budget-priced 100-400mm option, these are your options. The Tamron is not yet available as of review time, but the Sigma has proven itself to be a very good value. In the Sony vs. Sigma image quality comparison, it is again hard to determine a winner. Again, Sony's single slightly weak corner at 300mm shows up and the Sony appears to have a very slight 400mm advantage. The Sigma has slightly more geometric distortion. The Sony has a wider aperture over most of the focal length range (both are f/5.6 from 162-233mm). The Sigma is noticeably smaller and lighter, but lacks a tripod ring. The Sigma takes 67mm filters vs. 77mm. The Sony has a noticeably higher maximum magnification spec (0.35x vs. 0.25x). Note that the Sony is the only electronic manual focusing lens being compared in this section and it is also the only lens with a rear-positioned zoom ring. Hopefully those comparisons were helpful. Again, if you are using a Sony E-mount camera and can afford the Sony version of the 100-400, that is the best choice. 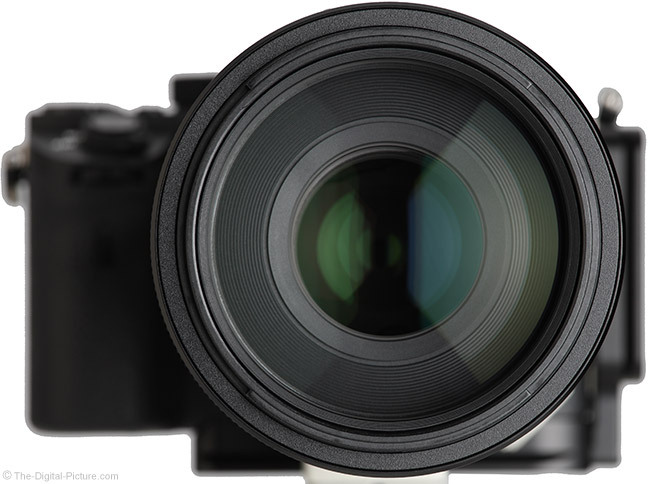 If budget-constrained, the Sigma with Sigma's own lens mount adapter is probably your best choice. Sorry for the delay in this review – I was having a little too much fun using the lens. And, reviewing thousands of images takes time. But, those images and the in-the-field use have given me strong insight into what this lens is capable of. Especially great news is that my final impression is a very positive one. The Sony FE lens lineup was in strong need of a long telephoto zoom lens and with the FE 100-400mm f/4.5-5.6 GM OSS Lens, Sony provided an excellent option. While this is not a super telephoto lens and it does not have a huge aperture opening (referencing a remaining-to-be-filled FE lens option), it is handholdable, performs excellently, is well built and does not require a second mortgage to purchase. It seems politically correct to say that the gear does not matter, and I totally agree that the skill of the person behind the camera is very important, but the gear definitely matters a lot as well. With this lens, Sony has put together best-in-class features with image quality to match. The Sony FE 100-400mm GM OSS Lens goes far to make both the person behind it and the subject in front of it look amazing.